The 2012 Ohio Abortion Report by the Ohio Department of Health shows that, following the historic 12 percent drop in abortions in 2011, abortions last year remained near the lowest levels ever, event with a slight rise from 2011. The 3 percent increase in 2012 (24,764 to 25,473) leaves abortions at the second-lowest level since 1976. The 2012 Abortion Report also reveals a decrease in Lucas County (Toledo), and a decrease in teen abortions statewide of 254. The 19 counties that make up the Toledo Diocese also realized a modest increase of 2 percent (45) over 2011. Significant progress was made in decreasing abortions among babies older than 20 weeks. Following the passage of the Ohio Right to Life Late-Term Abortion Ban in 2011, abortions after 20 weeks gestation fell by 30 percent last year. The Ohio Department of Health report also revealed a disturbing demographical insight, although African Americans make up approximately 12 percent of the population they account for 28.1% of abortions. In all, 9,694 black women had abortions in Ohio in 2012, up from 9,178 in 2011, an increase of 5.6 percent. By contrast, 13,109 white women had the procedure last year, down 1.7 percent. We are making a difference but there is still a lot of work to be done in our region and in Ohio. Visit the Get Involved page to find out how YOU can make a difference. 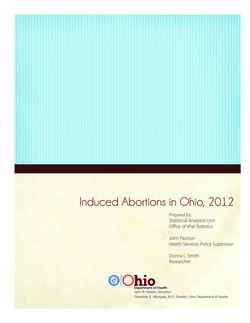 Read the entire 2012 Abortion Report.